"See that you do not despise one of these little ones, for I say to you that, their angels in heaven continually see the face of my Father who is in heaven". My daughter called me yesterday all excited to share with me once again something amazing my 22 month old granddaughter, Kammy had said. This time though she was more surprised by the content than her ability to say the words. She said they were sitting in the living room watching "Nemo", when Kammy said, "Mommy look" as she was pointing up to the ceiling. 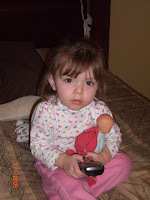 Her mom looked up and asked "what"?, Kammy answered, "the angel, Mommy, look the angel"! "The what"? "What did you say"? She again pointed up and said, "see her"? "See the angel mommy"? My daughter said she wanted so much to see the angel, she continued to look up even after Kammy seemed to lose interest, as if this angel was someone she'd seen before and was use to its' presence. I later shared with my youngest daughter that we shouldn't be surprised, God's word speaks of each of us having a guardian angel, sent to watch over us. I believe when we are yet still very young and our time since we have walked along side the Lord in the heavens, before being sent to earth, has still been quite short, we still have the ability to see the heavenly things upon the earth. As we grow older and experience more of this world, we somehow spiritually distance ourselves, and lose the ability to see. As I grow closer to the Lord, I can only pray I regain the ability to see the heavenly things while still here on earth. Then again, everytime the Bible tells of someone being visited by an angel they appearred frightened, because the first words the angel would speak would be, "don't be frightened"! Maybe that too, was due to being older. Gods' word says we must come to Him like a child. Kammy sure didn't speak as if she was the least bit afraid, she sounded happy that the angel had joined them for their evening of watching "Nemo"! How very sweet is this! I just love this story. Missed you tonight in class Cheryl. Hope all is well with you.